earthy | Scent Addicts - Perfume reviews, fragrance news, & more! 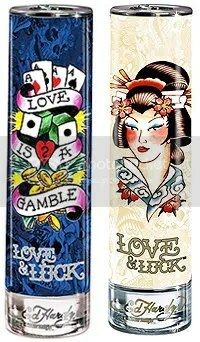 Get ready for another insanely awesome perfume bottle to drool over – designer Christian Audigier, the man behind the Ed Hardy name, is launching a new fragrance, Love and Luck. The fragrance will be available in both a mens and womens version, and will be available in December 2008. The womens version seems like it will have a Japanese feel to it, with Cherry Blossom and Red Sake being two of the notes listed. You can also expect to smell sandalwood and patchouli, giving it an earthy feel. 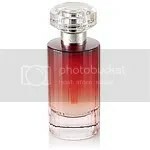 As for the mens, expect a relatively citrus concoction with such notes as bergamot, orange, and mandarin. Designer Christian Audigier has recently become a celebrity favorite, as his swimwear has been seen this summer on Britney Spears, Heidi Montag, Christina Milian, and others. His previous scents, simply titled Ed Hardy for Men and Ed Hardy for Women have also tasted sweet success, no doubt in part because of their trendy packaging and appeal to the tween and twenty-somethings markets. The bad news is that we have to wait so long to get a whiff of these exciting new scents. The good news is that they’ll be launched just in time for Christmas, so perhaps our stockings will end up smelling really good this year! Read further for detailed note listings for each fragrance.